Most of the fishing is much like last week but now we are starting to see more fish rising in the afternoons with some good results. Looks like the summer is here and the insect life is starting to happen. On the lakes try a Midge ball with a black Nymph as a dropper. Lake Eucumbene:- Most fisherman are getting browns and the rainbows are still out in the deeper waters yes the fly fishing has been hard for most of the fly fishers but the brown are looking good most reports are coming in with browns over the 4lb mark. Most of the fish are getting Caught around 7pm to 10pm best wet flies are Craig’s night time and black minnows, std black Nymphs. We are getting mixed reports of people getting fish and people not getting any at all it’s hard to say where to go but at the moment if you are going out fly fishing go at these times as above you should get better results. Overall the browns are in good nick and big I know thing can get hard at times but the longer you are out there at these time you are at good odds of getting a brown over the 6lb mark. Best wet flies are.. Craig’s, black Nymphs, woolly buggers, and when it’s dark a purple fuzzy wuzzy is working well on a slow retrieve. Caught on fly last Friday night at Seven gates. Lake Jindabyne:- Has been much the same best times are early mornings with a dry fly with a Nymph dropper in the afternoons woolly buggers, black phantom, woolly worm black red, most of the fishing has been ok late in the afternoons with the fish more active. With the lake staying at a good level the fish are starting to move closer to the banks again the Mudeye’s haven’t come on yet so when this happens I’m sure the fishing will pick up remember it’s still early days yet!! Best place to fish at the moment is kalkite black minnows, Craig’s, are the stand out flies. Both lakes are doing well on the troll with good results coming in from Jindabyne and Eucumbene Tassie devils are the stand out lures looks like it starting to happen at the right time. Other lurers are stings, blades, few fisherman are starting to use the Flat fish at a nice slow speed. With the reports coming the trolling is going well on both lakes. Most people are using Blades, tassies, and the new strike Pro Bob N Spoons and the flatfish. At the moment I would be fishing around Buckenderra Arm this seems to be the place to be with the reports getting better and better every week. Lake Jindabyne:- has been doing well up around Kalkite with good reports of browns and rainbow taking Blades, Rapalas, Tassie devils best times are early mornings, late afternoons when the weather is nice and cool. More reports from jindy would be good so if anyone has been fishing up around jindy you can sent your report to info@alpineangler.com.au or your photos to 0412915201. Eucumbene-:Bait fishing is still going well with good reports mostly down the bottom end of the lake most fisherman are getting there fish on worms and mudeyes the power bait is doing ok but with few rainbows about the worms are the pick of the baits. Good reports from seven gates, Middlingbank, Brookwood bay all these bays are doing well on worms and mudeyes. If you are going to use power bait put plenty of lead on and get it out there with at least 2 meter leader most fisherman have been trying to get the rainbows with no luck time for a change longer leader more sinkers!!! 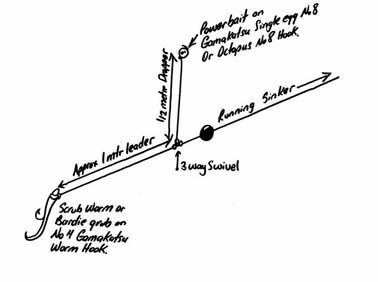 With the mudeyes go deeper from your bubble use about a 2 ½ to 3 meter lead or longer remember the fish are in deep water so start try longer leaders. With the worm you can do what you like the browns are moving around in the shallows and in the deep waters and they are loving the worms. 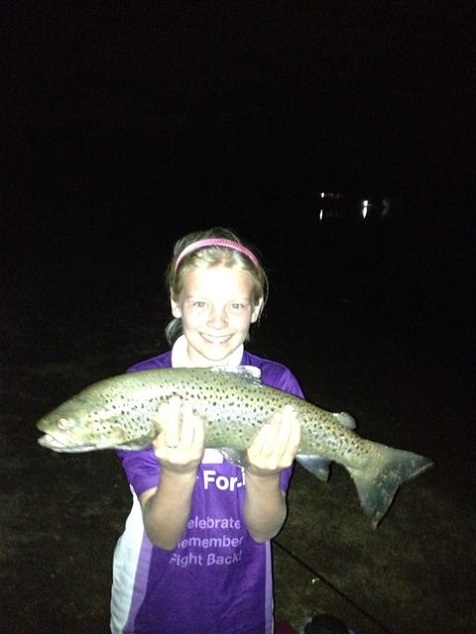 Just dropping a quick line to show you a nice brown caught by my daughter Meg on Friday night 13 December at Eucumbene. 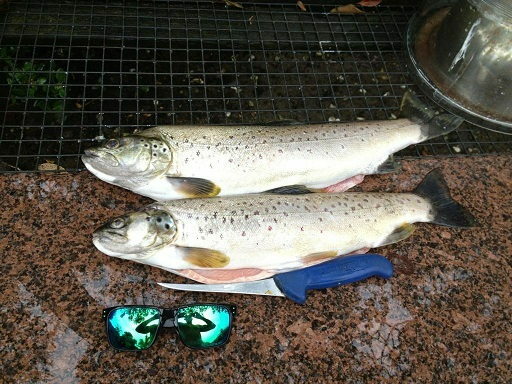 The dam fished alright until a wind change. Another small brown was released and a rainbow also caught; all on worms. JINDABYNE... Jindabyne has Improved over the few weeks with most of the fishing going well around Kalkite, Kalkite point, and around East Jindabyne.